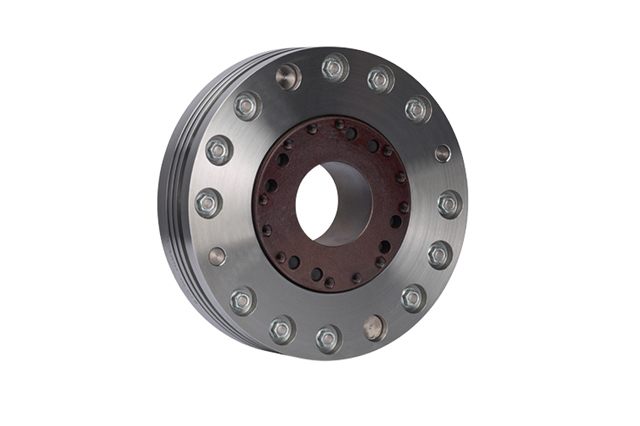 The UJT-500 series from PT Tech is a friction type torque limiter that is maintenance-free. The factory pre-sets the torque setting before it arrives to you. To avoid any unauthorized adjustments it is equipped with a tamper resistant torque setting. In order to change the setting a different complement of spring cup bolts needs to be installed. To ensure a predictable and consistent force on the friction material, the spring cup bolts are pretested and pre-shimmed at the factory. This eliminated the need to adjust the torque settings when it is being installed or in the duration of it wear life. Each of the spring cup bolts come in different colors to help distinguish the strength of each. Each of the UJT-500 series is available with optional configuration of input and output. They act like a torsional shock absorber that allows the setting to be above the engine or electric motors peak torque allowing it to not limit the engine performance. The UJT series are not subject to nuisance trip-outs the way releasable torque limiters are because they are continuously engaged. All dimensions are subject to change without notice.